By Jonathan Cook: A new documentary on Winne Mandela – called simply Winnie – is fascinating both for what it reveals about the hidden history of South Africa’s transition away from apartheid and for its relevance to other, current struggles. I highly recommend that Labour leader Jeremy Corbyn get his hands on a copy as soon as possible. As someone who grew up vaguely aware of the apartheid story unfolding nightly on the UK news, I was shocked to see how different those events looked decades later, seen through more critical eyes. 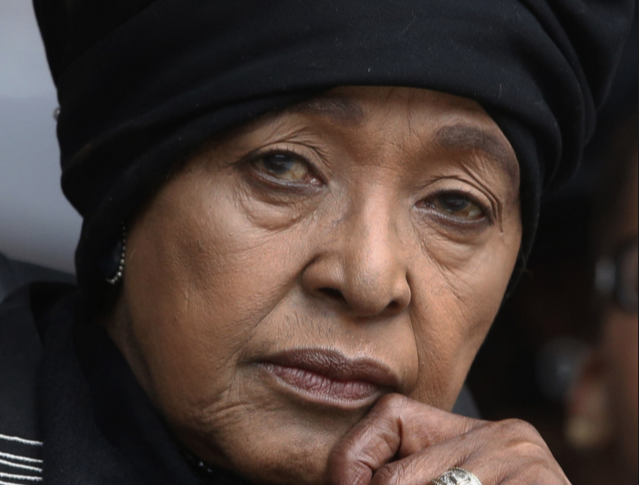 The new perspective is long overdue: Winnie Mandela died at the beginning of this month. For those who bewail the “fake news” of the corporate media as if its mendacity was some kind of recent development, Winnie is a useful corrective, reminding us that the modern media’s primary role has always been to maintain a political, social and economic environment conducive to the accumulation of wealth by the rich and powerful. Although the film briefly recounts the history of apartheid, its strength lies in its emphasis on Winnie Mandela as the embodiment of the liberation struggle after much of the ANC leadership, including her husband, had been locked away on Robben Island. She became the ANC’s centre of gravity and its spokeswoman, both locally and internationally, the flickering light that the apartheid regime dared not snuff out for fear of provoking a popular uprising. She became “the Mother of the Nation”. The film’s focus is very much on the transition years, and the Mandelas’ increasingly strained relationship. The documentary leaves little doubt that long years of confinement had left Nelson Mandela a largely broken man. Interviews with apartheid’s security officials show that, sensing this, the South African government began a campaign to reshape Mandela’s worldview and prepare him for a release in which he would be repurposed to serve as the figurehead of a new South Africa. It would look more inclusive but change little in terms of the concentration of wealth and property in white hands. A new black elite based on the ANC leadership would legitimise the continuing economic oppression of the black majority. Winnie was the fly in the ointment. She had helped to keep the revolutionary spirit of the ANC alive and relevant to South Africa’s disenfranchised black population, and she was not prepared to jettison class politics for a western-friendly identity politics. From that moment on, the apartheid government was determined to create a personal, as well as ideological, rift between her and Nelson Mandela. They used smears to discredit her with the international community and accentuate divisions within South Africa’s black population. The vilification would reach its peak with efforts to tie her to the murder of a 14-year-old boy, Stompie Moeketsi. Doubtless, if these events were current, rather than some 30 years old, those doubting the official narrative would be accused of spreading “fake news” and of being “conspiracy theorists”. But apartheid officials are clear in the documentary that they were prepared to go to great lengths to damage Winnie Mandela. In fact, while the official story persists that she ordered one of her bodyguards, Jerry Richardson, to kill Stompie because the boy was a police informer, Richardson later confessed that he killed Stompie after the boy found out that he was the informer. There are two especially revealing moments in the documentary. Vic McPherson, head of a smears unit in apartheid South Africa’s security services, admits that, as part of Operation Romulus, he had some 40 journalists working for him spreading disinformation in the South African media. He proudly declares that he could get government smears about Winnie Mandela on to the front page of South African papers as news, which was then relayed to international audiences through repetition by the foreign media. He was also able to vilify Winnie Mandela with the help of the South African Broadcasting Corporation, which allowed him to make a documentary about her. Even though it was government propaganda made by South Africa’s version of Josef Goebbels, it was shown on 40 US channels and led to the US declaring her an international terrorist. The other revealing moment is at the Truth and Reconciliation Commission. Most of us get moist-eyed about the inquiry, but its agenda was again hijacked by apartheid’s leaders as a way to further damage Winnie Mandela and prevent her from being appointed deputy president of the ANC. In fact, she was the only ANC official brought before the commission. Criminal suspicions about Stompie’s murder were again raised against her as if proven. Desmond Tutu does not emerge from this episode well, using his platform there to publicly demand an apology from her, when there was no more than unreliable hearsay connecting her to the murder. It is hard not to conclude, after watching this documentary, that Winnie, not Nelson, was the greater hero, the true conscience of the anti-apartheid struggle, and that the apartheid leadership and the western media conspired to ensure she would become little more than a sour footnote in history books about that era. Nelson Mandela was preferred over Winnie Mandela because his conciliation with – even appeasement of – apartheid’s racists appealed to western consciences more than her demands for a reordering of society and for tangible, not symbolic, justice for the victims of apartheid. This fight continues in many places beyond South Africa. The struggles of our time are to reform western societies to stop the pillage of the Earth’s resources, to reverse climate breakdown, and to expose the self-destructive logic of western economies based on the myth of endless growth. Those leading these struggles will face implacable opposition, just as Winnie Mandela did. The vested interests that control our societies are deeply entrenched after more than a century in power. They have the politicians, the media, the courts on their side. And their fight will be as dirty as the one waged by the apartheid regime. We must develop the critical intelligence to prevent ourselves being manipulated and set one against the other. Otherwise, those who seek to challenge the current order will either be tamed, like Nelson Mandela, or destroyed, like Winnie Mandela.